I’ve got dozens of past issues of the beautiful food magazine Saveur on a bookshelf dedicated to cookbooks in our home. In the spirit of reuse, renew and recycle, I decided to pull out an issue from last spring to see what sparked my imagination. In an article entitled “The Ice Queen: The rise, fall, and rise of America’s favorite lettuce, by Irene Sax, I stumbled upon this recipe for these lettuce wraps. For anyone who’s ever been to P.F. Chang’s and fell in love with their lettuce wraps, you know the hunt is on for that recipe. This one is real close. It’s delicious. While at the grocery store–the one that’s carpeted throughout (you know which one! ), I stood in the produce section with the regular lettuce in one hand and the organic lettuce in the other. The organic was about $1.50 more than the regular. I splurged, helped a farmer, and tasted the difference. Organic lettuce is the perfect choice for these wraps. So… I made this for dinner on Thursday night so that you could make it for dinner on Friday night. Put the chicken, cashews, mushrooms, and chopped green onions into a bowl. Combine the soy sauce, oyster sauce, wine, cornstarch, sugar, salt, and pepper in a bowl. Pour over the chicken; toss. Let this marinate for 15 minutes. Heat the peanut oil in a large skillet over high heat. Add the garlic; cook for 10 seconds. Add the chicken mixture and cook, stirring, until browned, about 5 minutes. Transfer the chicken to a bowl. 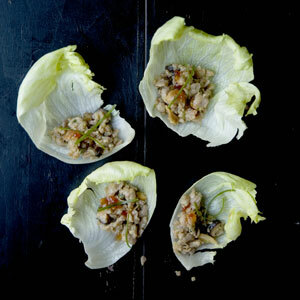 To serve, spoon some of the chicken onto each lettuce leaf. Garnish with the julienned scallions and a small dollop of the chile sauce. This recipe originated with Bee Yin Low, who writes the blog www.rasamalaysia.com and appeared in the May 2009 issue of Saveur Magazine, Issue #120, page 81. Subscribe to comments with RSS	or TrackBack to 'Chinese Minced Chicken Wraps'.